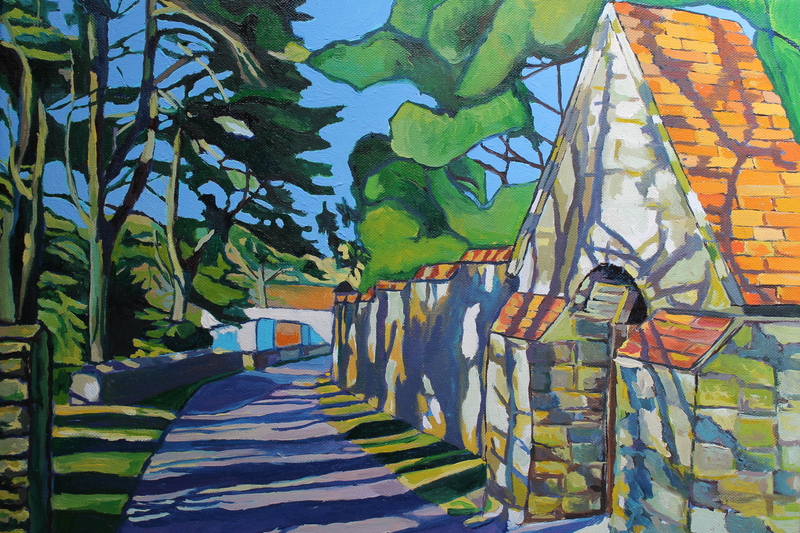 This painting is of the Abbot’s gate which leads via various steps, up a steep incline to the side of Caldey Monastery on Caldey Island, off Tenby, West Wales. The steps lead to the Abbot’s Chapel which is a wonderful wooden-panelled chapel, used seldomly and usually on special religious occassions or when the electricity fails in the main Chapel! This painting evokes long summer days spent languidly walking around the wonderful Holy Island of Caldey – the long shadows cast by the trees seek to evoke this stretched languidness and summered relaxation. Visitors to Caldey will be used to walking past this gate, forlornly perhaps as they hurry to catch the last boat back to Tenby. The long shadows also hope to express the time dwindling as the sun begins it’s descent to the West and over the sea’s horizon, pulling the last light of the day with it. I use purply blues to evoke this sense of leaving somewhere special, affirming, spiritual even, as purple expresses both the hues of the sun-setting and the spirituality of this monastery and holy island; both leaving a lingering impression. Wonderful Caldey is also set apart by it’s trees which is very unusual if not unprecedented among the Welsh islands. Thus this painting has two great Caldey signatures, the gate and incline to spiritual nourishment and the joy of time spent on this unique treed island. Third Most Followed Artist on Artfinder!